These are Versace 19.69 Italia (19V69 Italia), not Gianni Versace. Lens Tech: Gradient. Lens Color: Brown. Includes Box case with cleaning cloth. Height of the lens! A few short descriptive paragraphs below. In addition to your eyeglasses, an original case is included. Model: Tribute Collection; VE4353. These sunglasses are the ultimate in luxury fashion. Versace Sunglasses feature a fashion-forward and elegant sunglasses collection. Versace Sunglasses. Versace Case & Gift Box (Color & Style May Vary). Model #: Mod.4319 GB1/81. Sunglasses w/ Case. An unpaid case will be. In most cases I can accommodate reasonable requests. No scratches. New versace black sunglasses. No box. No tags. No case. Legit . made in italy. Stamped for authenticity. Model numbers printed on inside . VERSACE Sunglasses. Original VERSACE Trademark Case, Cleaning Cloth, and Authenticity Cards Included. 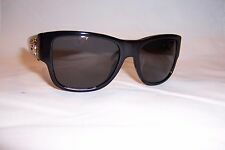 Versace Sunglasses Black Square With Gray Lenses. Condition is Pre-owned. Shipped with USPS First Class Package. Frames have scratches and fading of the paint. Model information on the inside of the arm is faded. Lenses have many scratches and could use replacement depending on preference. Fuse lenses is a good place to get replacements. Embossed detail on the arms. Does not diminish the overall appearance of the item.Very Good - Well-maintained. Shows minor signs of wear that are consistent with light use.Good - Shows signs of regular use. Model: VE 4275. 100% VERSACE AUTHENTIC. Lens Color: GRAY POLARIZED. Carrying Case NEW COLLECTIONS. Included (COLORMAY VARY). Color Code: GB1/81. Model: Versace MOD 4303 GB1/T3. Case: Authentic Versace case. Arm Length(mm) : 140. Lens(mm) : 58. Lens Color: Gray. We will reply as soon as possible within 24 hours. Bridge(mm) : 17. Rhinestone "V" detail at temples with color accent. Black / White. Model: VE 4209. Temple Size: 125 mm. Lens Size: 58 mm. Bridge Size: 17 mm. Color: 924/87 Black. We do our best to describe the defect, but since it can be difficult to describe. Lenses (virtual red or white marks placed to show relative size/position) : several tiny faint hard-to-see peripheral surface display micro-marks that should not significantly affect vision, pic #7/10. Model: Versace 4350 Sunglasses. Gender: Female. Lens Color: Grey. 100% Authentic. What's included. UP FOR SALE IS A PAIR OF VERSACE SUNGLASSES, MODEL 4307 COLOR GB1/87 SIZE 58. THIS ITEM IS IN GREAT CONDITION (SEE PHOTOS). Lenses are grey polarized. A Black Versace case will be provided. LensesARE polarized. Not even "good fakes. Sunglasses are not to be considered flawless. Condition: Gently worn - Sunglasses are in great condition with very minor scratches in lenses. VERY NICE SUNGLASSES 🕶 😎. Model: VE 4229. Color: 913/13 Black Havana. Bridge Size: 18 mm. VERSACE VE 4312. 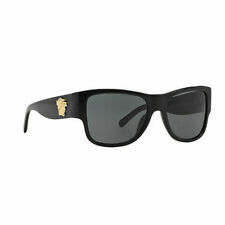 - AUTHENTIC VERSACE Mod. Polar Grey Lens Aviator 60mm Sunglasses. VERSACE Mod. - Versace Hard Case. Lens Color: Polar Grey. Polarized Lens: No. Lens Width: 60. Model: Versace MOD 4252 GB1/87. Arm Length(mm) : 135. Lens(mm) : 57. Lens Color: Gray. Model : VE 4275. VERSACE sunglasses. With case. Case is in great condition! VERSACE Sunglasses. Original VERSACE Trademark Case, Cleaning Cloth, and Authenticity Cards Included. 56 | 20 | 44 | 145 |. FRONT MATERIAL: plastic. RX-ABLE: yes,standard. BASE: Base 6 decentered. GEOFIT: GLOBAL. BRIDGE DESIGN: saddle bridge. 100% Authentic Versace. See pictures for details. Lens Color: Solid Grey. Includes Original case (slightly stained on the inside), and cleaning cloth. Style: Square. Arm Length(mm): 120. Pick Up: Cash or Debit. FRONT MATERIAL: PLASTIC. BASE: Base 4. GEOFIT: GLOBAL. BRIDGE DESIGN: saddle bridge. GENDER: man. BASE: Base 4. GEOFIT: GLOBAL. FRONT MATERIAL: plastic. RX-ABLE: yes, standard. BASE: Base 6 Decentered. GEOFIT: ASIAN. Color Code: 5119. Style Number: 3203 A. Item: Eyeglasses. Designer : VERSACE. Color : Black. Case Included : Yes. Size : 60-18 135. Condition : New! Model: VE2173. These sunglasses are the ultimate in luxury fashion. Versace sunglasses feature a fashion-forward and elegant eye glasses collection. Versace Sunglasses. Versace Case & Gift Box (Color & Style May Vary). 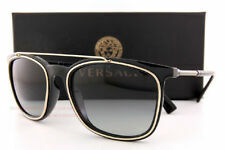 RARE Versace Rock Icons 57mm Square Sunglasses. - Lens Color: Gradient grey. - Style: Square. 100% AUTHENTIC. - Case, cleaning close and gift box included. AUTHENTIC VERSACE EYEGLASSES. (Not plastic): Lightweight comfort. UV protection. Impact resistant.